All Clean Services offers complete residential and new construction window cleaning which includes window tracks, sills and screens. Our window Technician Steven Rudd has been cleaning windows at All Clean services for 5 years, and has a total of 15 years professional window cleaning experience. We consider him to be an expert in his field, he's very conscientious, courteous and personable. Window cleaning is recommended at least twice per year. One window cleaning in early fall and one window cleaning in late spring. Dust storms, landscaping and rain storms and other outside elements can wreak havoc on your windows and window screens. House dust and fingerprints from the inside can easily build up on windows causing staining and discoloring. We clean your window screens too! Cleaning your window screens yearly can help prevent them from dry rot and keep them pliable. Our window technician will remove your screens, clean the dirt off and wash them with a special cleaning solution that will keep them from dry rotting from the weather and sun. We provide our customers with personalized service that is catered to their home. 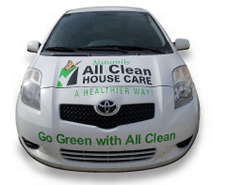 Our All Clean staff is equipped and skilled to take care of all your window cleaning needs and more. We get the spots others leave behind! We clean the inside, outside, window sills, screens, tracks… the entire area. 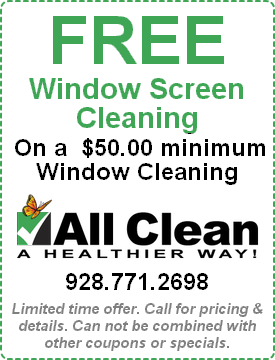 Your sliding glass doors will be completely clean! Removing Water Spots requires more than common or traditional cleaning methods, Contact us today to see what we can do for you! Don’t put your business or property on the line with unprofessional window cleaning companies. All Clean has you covered from top to bottom. Our cleaning professionals are fully insured and bonded. Our window cleaning staff is skilled and experienced to handle all of your commercial window cleaning needs and more. These are just some of the things that you will find on new windows, frames and tracks of a recently completed construction project that we will remove for you!